during filming of Flags of Our Fathers. 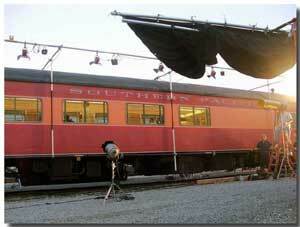 A club-lounge car (the Overland Trail), and a coach (the Amber Trail), are available for film, video, and still work. The Overland Trail features a classic, quarter-circle bar and a streamline modeme interior appropriate for the late '30s through the early '70s. It also features an authentic railroad barbershop and a typical prewar double bedroom. The exterior is smooth-sided and can easily be custom painted. The Amber Trail is a typical long-distance coach with 44 seats and large restrooms at both ends. It can pass for a commuter coach, an intercity chair car, or anything in between. The exterior of the car is smooth-sided, so it too can be painted. Our railcars have appeared in many major motion pictures, on television, and in commercials and print advertisements. Examples, Flags of Our Fathers, Bugsy, Species, Fatal Instinct, Home Front, Lily in Winter, Infinity, Sinatra, Crimes and Punishment, and commercials for Peugeot, Flags of Our Fathers. With our associates, we can assemble trains of any size and configuration. 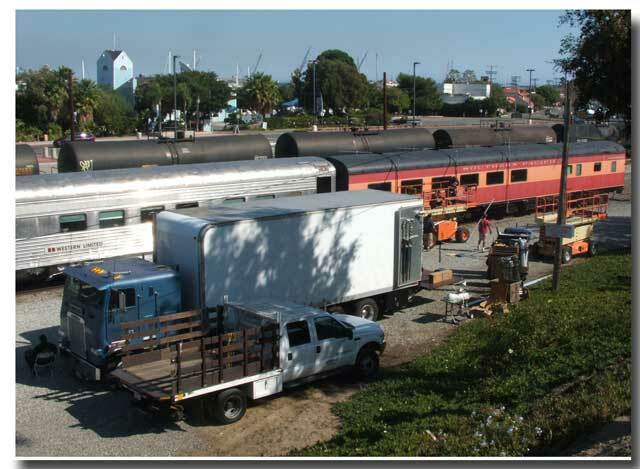 We can also help you host a great WRAP PARTY, whether stationary at Union Station in Los Angeles or on the move between L.A. and San Diego. Your cast and crew will never forget the unique celebration aboard the Overland Trail.